I have always been drawn to light and shadow. How the sunlight is illuminating an object. What color is in the shadows of the sunlit object. In this seascape scene I was drawn to the light bouncing off the top of the rocks and seagulls. Today I will describe the steps I took to complete this original watercolor. Working from a photo I had taken a while back I started with a pencil drawing. Full size graphite drawing for “Basking In the Sunlight”. 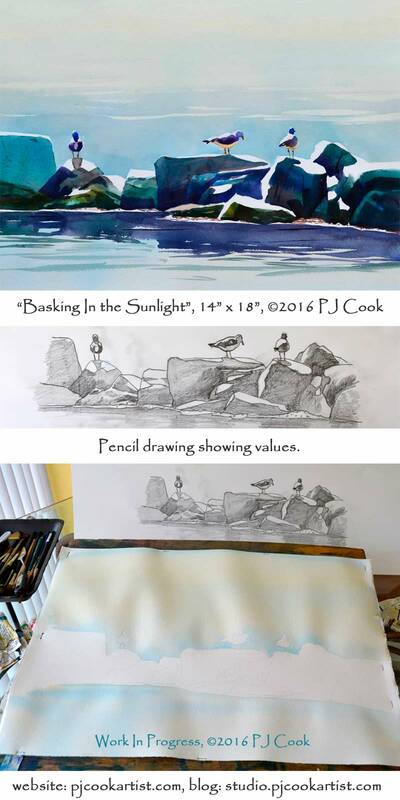 Looking for interesting shapes in the rocks that make up this ocean breakwater, I did a detailed pencil drawing. Using a 2B lead I shaded in the darker values. This helped me to see the light areas where the sun is hitting the birds and rocks. Look for interesting shapes in the light and dark areas. Raw Sienna, Light Red, Violet, Blue Grey, Ultramarine Blue, Winsor Blue, Winsor Green. I’m using a half sheet of Lanaquarelle 140 lb cold pressed watercolor paper. I soaked the paper for 2 minutes then stapled it to my 1/4″ thick marine plywood. Can you believe I ran out of staples! Look in the image above and you can see where I realized that I had only a handful of staples left. I spaced them out around the paper and let it dry. This painting is transparent watercolor. I use a variety of paint brands. Mostly Winsor & Newton and Holbein. If you want to look into the different watercolor paints there is a great website to check out by following this link http://handprint.com/HP/WCL/water.html. As you can see in the photo above I have the pencil sketch propped up in front of me for reference as I begin the first transparent wash. The board is raised up about 4 to 5 inches. With a large hake brush I paint a light wash of raw sienna from the top of the paper. Adding more water so I have a gradation. I bring this down to the rocks, being careful not to touch the white paper of the sunlit rocks. I add a wash of blue grey that gradates in the opposite direction. Darker close to the rocks. Turning the board upside down may make this easier. I basically did the same thing below the rocks. This can be seen in the image. Once the paper has dried I painted the water above the rocks and painted around the wave ripples as I faded it to clear water. Again this might be easier if the board is upside down. This can be seen in the photo below. From here I painted the rocks and seagulls with strong darks. Using intense blues, greens and reds I paint in the shadow side of the rocks with a 1″ flat brush. I add more darks and color before the paper dries. It is important to work around the sunlit areas that are staying the white of the paper. The birds were painted with a wash of raw sienna for the reflected light on their bellies. When that dried I painted the shadows on the birds. The reflections in the water is painted last with the same darks used for the rocks. I add cracks and crevices to the rocks but do not touch the sunlight areas. There is seaweed in the water close to the rocks that is picking up sunlight so I paint that with raw sienna. I may darken that a little after I view the watercolor painting for a while. Here is the finished watercolor painting shown above. Transparent glazes have a radiance of color and texture that can be seen thoughout the painting. A rather simple but effective subject matter that hopefully leaves the viewer with the feeling of bright sunlight near the ocean. Please comment and forward this post using the social media links on the side of the page. Check out my instagram page too! Thank you once again for an informative insight as to how you progress with your paintings. Lovely work. Thanks Sally, I’m happy that you picked up a new tip or technique that you can use in your own painting. Would you like any specific painting tips that you want to learn? Thank you for showing your process on this beautiful painting. I’m putting this on my “to paint” list. Living about 1 1/2 hours from the Delaware beaches, I can just picture this scene. Thank you for sharing. Thanks Nell! Have fun painting.